After months of political upheaval and chaos in the bond markets, few investors believe austerity programs are a route to growth and debt reduction. When the Troika holds your country up as definitive proof that austerity works, you know you’re in big trouble. First it was tiny Latvia, singled out by International Monetary Fund chief Christine Lagarde at its annual meeting in September as a shining light for the eurozone. This was after a 25 percent drop in Latvia’s GDP—more than in America during the Great Depression—which forced nearly one in four employees out of work and one in twenty to flee the country. Now it’s Ireland’s turn. “There is some good news,” insisted French technocrat Philippe Mills, chair of an EU subcommittee on government bonds, at a gathering of terrified bond investors in Brussels days before the October European summit, billed as make or break for the euro. “Ireland is now overachieving the targets we set,” Mills said, noting admiringly how the eurozone’s most swingeing wage and spending cuts had restored the Celtic Tiger’s competitive position and propelled its trade balance into positive territory. This was exactly the sort of “internal devaluation” that the Troika—the improvised council of European Commission, European Central Bank (ECB) and IMF now managing the euro crisis—was prescribing for the wasteful Mediterranean rim. 24 percent had cost socialist Prime Minister José Luis Rodríguez Zapatero his job, as the right-wing People’s Party prepared for a clean sweep in the November 20 elections. Finally, Italy, the third-largest European economy, with massive public debt, was now the subject of big sell-offs by bond investors. Interest rates on Italy’s sovereign debt had soared to more than 7 percent, five points higher than Germany’s, pushing up the cost of debt servicing beyond the limits of sustainability. Not even the economy of Gucci, Prada and Fiat seemed able to compete with the eurozone core and export its way out of the crisis. Unit labor costs in Italy had barely fallen, compared with a 10 percent reduction in Ireland since the crisis began. For Mills and the other eurocrats at the Association for Financial Markets in Europe’s annual government debt conference in Brussels, all this was proof that the “Club Med” economies had not gone far enough along the Irish route of wage and spending cuts. With no liras, escudos, drachmas or pesetas left to take the easy way to competitiveness (i.e., sovereign currency devaluation), only more internal devaluation, it was argued, would set the wayward Mediterranean back on track. It would be natural for the dark-suited bond vigilantes, bankers and ratings analysts at the conference to be persuaded by that argument, but they weren’t. Now, after months of fear and chaos in the bond markets, few investors believe simultaneous austerity programs are a route to growth and debt reduction. “Ireland has met every condition they imposed. It has even eked out some export-driven growth. But the global economy is tanking, and the engine will soon start to sputter,” said Willem Buiter, chief economist at Citigroup, at the conference. He continued ominously, “Once the wolf is at Italy’s door and we find ourselves on the brink of another depression, maybe then they will reconsider.” It was chilling to hear a Citigroup adviser sound as gloomily progressive as Paul Krugman in his critique of eurozone economic orthodoxy. But that’s just one measure of how rotten things are in the European capital. To get a real feel for what overachievement means in a Troika adjustment program, I attended the yearly conference of the leftist Irish think tank TASC at Croke Park Gaelic football stadium in Dublin. The arena was the scene of the Bloody Sunday massacre in 1920, when the Royal Irish Constabulary opened fire on spectators, killing fourteen. Bloody massacre seemed the appropriate term for Ireland’s model performance in the austerity league. “Of course you can get rid of a trade deficit if you carpet-bomb your economy and drive down imports,” said Michael Taft, an economist at the Irish labor union UNITE. He catalogued a string of hair-raising statistics: domestic demand in Ireland is down 29 percent since 2008. Investment has fallen by 72 percent. Unemployment has risen from 6.5 percent to 14.4 percent in three years, and half of all jobless workers are long-term unemployed. Aside from creating severe hardship for the most vulnerable, the cuts in basic welfare—from child benefits to pensions—prescribed by the Troika and enthusiastically adopted by successive Irish governments have had a massive negative multiplier effect on growth. “One euro cut from benefits can actually mean more than one euro off GDP, since the unemployed and working poor save so little of their income,” said Taft. Any improvement in exports is confined to Ireland’s multinational enclave economy, where revenues at companies like Google and Bayer stop off briefly on the Emerald Isle in their global tax minimization strategy, capitalizing on Ireland’s 12.5 percent corporate tax rate. “It helps reduce the trade deficit, but it does nothing for the domestic economy,” said Taft. Indeed, Ireland’s debt is still out of control after the most expensive bank bailout in history. 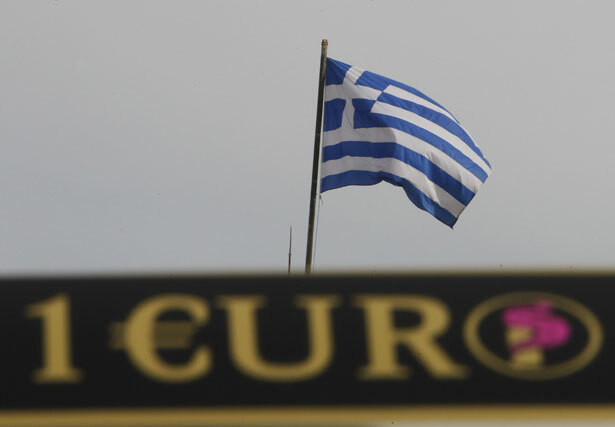 By some measures, Irish debt is as big as Greece’s. Boarded windows in small shops around the stadium and pasty-faced youths and former construction workers hanging outside the dole office were further challenges to the Irish success story. Off O’Connell Street, Polish immigrant workers gave farewell embraces and boarded a bus bound for Krakow. This return migration was part of the eurozone plan to make the European labor market more flexible. But no one imagined that some 100,000 Irish would also be heading for Canada, Australia and New Zealand, rolling the emigration clock back decades. The residents of the sumptuous mansions of Shrewsbury Road have already written down their debt. Bankrupt real estate developers have offloaded billions of it onto the state-owned “bad bank” Nama, created by the government as a deposit for toxic real estate debt. Yet, as Manley noted bitterly while driving through these suburbs, none of the property kings have lost their trophy homes. Nama even pays them an average of 200,000 euros a year while the debt workout is completed. Notorious speculator Sean Dunne, who developed the so-called Style Mile in London’s upmarket Knightsbridge, fled the European slump, leaving billions in debt, and bought a house in Greenwich, Connecticut, next door to hedge-fund billionaire Paul Tudor Jones. The Irish government, now owner of Ireland’s two big zombie banks, has pledged to pay back every cent to their top creditors. In October it granted $1 billion to senior bondholders of Anglo Irish, the property developers’ favorite bank during the bubble years. Once all debts have been paid, the bank will fold. So fierce in imposing austerity on the public and so generous in socializing bank debt, Ireland is a ghastly example of the “success” of internal devaluation in eliminating a trade deficit. But there is a terrible truth to the eurocrats’ orthodoxy: unless Europe takes action to boost demand, turn sovereign debt into euro bonds and iron out trade imbalances, Ireland is indeed the only model available to the deficit countries of the south. The eurozone’s debt trap is in fact a classic balance-of-payments crisis. At around $180 billion, the collective trade deficits of Spain, Italy, Portugal and Greece—including interest payments and repatriated profits—are equal to Germany’s trade surplus. The Club Med must import capital to finance its deficits. Before the crisis, the money came in purchases of higher-yielding Greek, Spanish and Portuguese bonds and real estate investments in Ireland and Spain, credit eagerly provided by the banks and the markets in search of higher returns with no exchange-rate risk. The euro, after all, was an irreversible currency union. Few remembered how Argentine president Carlos Menem had used the same terms when he spoke of that country’s currency board, which held the peso on par with the US dollar during the 1990s before the dramatic default and devaluation of 2002. For years, such confident wagers in economies such as that of Greece—whose fiscal position was being creatively accounted with the help of Goldman Sachs—made the euro experiment seem workable. But since the bubble burst in 2008, negative feedback loops of fear and insolvency have driven funds north, not south. Bonds in the peripheral economies are toxic, and the once-booming property markets in Spain and Ireland are lifeless. So the financing of eurozone deficits must come from public sources, such as the ECB or the European Financial Stability Facility. If that funding is not sufficient, the only alternative, aside from leaving the eurozone, is to follow Ireland on the internal devaluation route. But if every country takes the same route, demand will collapse and Europe will slide into what IMF chief Lagarde called a “lost decade” of negative growth, making peripheral debt even more toxic. “We do not compete with Germany; we compete with the other PIIGs [Portugal, Italy, Ireland and Spain]; so if we devalue internally, it is Portugal and Spain who suffer,” said Greek MP Vangelis Papachristos. Papachristos, a sophisticated Keynesian economist from the impoverished Preveza region, offered a historical example. The eurozone is in effect a re-creation of the pre–World War II gold standard. If internal devaluations are pursued collectively they kill all economic activity. In the ’30s this realization only gradually sank in, as countries abandoned the anchor to gold and finally adopted expansionary policies. “We are now at the post-1929 stage, when they tried to go back to the previous model; it was not until 1933, even 1937, that FDR realized there would be no return,” Papachristos said. How long will it take this time? “As long as governments continue to be captured by their bankers,” he replied, during a conversation in the Greek Parliament on the night of Papandreou’s final confidence vote. Papachristos’s evocation of the Depression might have seemed farfetched in any other country. But depression is the only word to describe Greek society after two years of Troika-driven misery. “The economy has collapsed; no bank lends money anymore,” said Stelios Kouloglou, head of a new Internet TV channel. “Papandreou has left of his own accord; the next one will leave in a helicopter,” he added with a smile. Unemployment has risen from around 7 percent to roughly 18 percent in three years. Small business has collapsed, with 68,000 shops closing in the past year. Hospitals are running out of basic supplies and personnel. “Due to cuts, we now have two nurses for every sixty patients,” said Olga Kosmopoulou, a doctor in the large Athens hospital Nikea, where patients were crammed into wards and homeless men took shelter in doorways. “Patients are being charged 80 to 100 euros for tests now, so they just don’t turn up,” she added. She introduced me to a cleaner working for a private subcontractor, who earned 500 euros a month for a sixteen-hour day. “She has no labor rights, no union,” said Kosmopoulou. 30 percent and added 40 percent more in taxes; I’m now earning less than 1,000.” At a food and medical supply center run by the NGO Doctors of the World in the depressed city of Perama, half an hour south of Athens, hundreds of old-age pensioners queue for food aid every day. “It’s the first humanitarian crisis in a developed European country,” said filmmaker Aris Chatzistefanou. At the other end of the age spectrum, young people who organized Generation 700 (a reference to the average wage for people under 30) in 2008 after the Athens anti-police riots joke that they’ve changed the campaign name to Generation 500, to reflect the latest earning trends. Perhaps the most savage austerity measure is a new tax on property, levied along with the electricity bill. “We are working with people who have had their power cut because they did not pay the tax,” said Ioana, an activist at Oxidiodia, the “I Won’t Pay” campaign, which is organizing civil disobedience against the tax. In actions typical of the fearless Greek aganaktismenoi movement, revolutionary electricians reconnect citizens who have joined the campaign. There are similar protests at highway toll booths, where workers lift barriers on selected days to fight the austerity measures. Other imaginative anti-austerity campaigns are growing throughout Europe. In Spain, where evictions of foreclosed homeowners are far more common than in Ireland or Greece, protests are held at selected evictions, and many have been prevented. In the run-up to the Spanish elections, the indignado movement held massive demonstrations, defying police bans on protests in the Puerta del Sol in downtown Madrid, where the first occupation of a public square in Europe occurred in June. This is inspiring similar actions in Athens, where Syntagma Square was occupied for two months last summer, and now in US cities too. There appear to be two basic reasons for the failure of the European left to benefit from the spontaneous popular protests. First is the crisis of sovereignty, as key decision-making is shifted from the national arena to Brussels, Berlin, Paris and Frankfurt. The extraordinary events in Greece are the most extreme example. First Papandreou proposed holding a referendum on the October 26 Brussels agreement, in which Greece will receive further Troika financing, with a negotiated default on 50 percent of its debt. In return, a further round of savage austerity was demanded, including dismissal of 150,000 public sector workers over three years, more new taxes and probable dismantling of collective bargaining agreements. The plan also set up a “monitoring capacity,” in which a team of euro technocrats will “advise and offer assistance in order to ensure the timely and full implementation of the reforms.” This challenge to national sovereignty could not but evoke the humiliating experience of 1893, when Greece defaulted on its external debt and later had to accommodate inspectors from Germany and other Northern European creditor countries, who made sure taxes were used to pay off debt and not for the national budget. The threat that Troika crisis management poses for democracy and national sovereignty is only beginning to emerge. Opinion polls show that two-thirds of Greeks oppose the Brussels agreement. Yet when Papandreou announced a referendum, the response from Brussels and Berlin was furious intolerance for democratic rights. Finland’s Olli Rehn, the EU economic and monetary affairs commissioner, called the planned plebiscite “a breach of confidence” and demanded that all Greek political parties sign a document committing to the Brussels accord. German Chancellor Merkel and French President Sarkozy—now known scornfully in Southern Europe as Merkozy—warned that Greece would be expelled from the euro if the people rejected the austerity plan. Aware that after such an aggressive ultimatum very few Greeks would dare to vote no, the Greek left rejected the referendum and blamed Papandreou for blackmailing the people. “The stance by Merkel and Sarkozy was a blatant violation of European law and of our constitutional right to self-determination,” said George Katrougalos, a leftist law professor at Demokritos University in Athens. “I was amazed that the left did not support the referendum; we can’t support direct democracy only when we know we’ll win.” The split on the referendum was just one example of the difficulty of organizing anything more than mass protest when decision-making power is shifting to unaccountable technocrats. A fitting end to this chapter of Greece’s via crucis was the formation of a provisional government in November charged with implementing the Brussels agreement. It is made up of technocrats under the supervision of interim Prime Minister Lucas Papademos—former vice president of the Troika’s ECB. The only gesture to any segment of public opinion was the inclusion as transport minister of Makis Voridis, a leader of the rising far-right Laos Party, known for his racist attacks against Albanian immigrants. The issue of sovereignty has also divided the left in the task of challenging the depression economics now in vogue. There are two responses to beggar-thy-neighbor internal devaluation. One is a fast track to some kind of Keynesian United States of Europe, in which the ECB issues European debt in exchange for sovereign debt, thus reducing interest rates for the beleaguered periphery, along with harnessing the European Investment Bank to boost investment-driven growth. This is what Stuart Holland, an economist at Portugal’s University of Coimbra, has defended for more than a decade. “We can have a European New Deal with existing institutions,” said Holland at the Dublin TASC conference. “We would borrow to invest in everything from transport to urban regeneration.” Meanwhile, “China would jump at the chance to buy euro bonds as an alternative to the US Treasury market,” he said. The logic of mass issues of euro bonds to avoid a series of defaults and collapse of the euro is so compelling that most participants at the Brussels bondholders conference who attended a session on the question considered it to be perfectly viable. The exasperating thing about the crisis is that, when viewed as a single unit, the European economy meets the conditions for a progressive expansionary drive to create employment with good wages. Selective industrial policy could be used to compensate for the competitiveness gap between periphery and core, the real cause of the crisis. Greek socialist MP Papachristos thinks mechanisms could be introduced, along lines recommended by US economist Thomas Palley, to fine-tune monetary policy to correct eurozone imbalances. Some variant of a “European New Deal,” as Holland and Greek economist Yanis Varoufakis call it, is supported by the majority of left parties. But it raises hugely difficult issues of sovereignty and democratic control. For the moment, institutions like the European Investment Bank, which Holland believes can be hijacked by the left and turned into vehicles for economic change, are barely accountable. The European Parliament continues to be a sad parody of real democracy. The other left plan is to default on the debt and simply leave the monetary union. “This is a neoliberal project, and we have to break with it,” said Galway University economist Terry McDonough at the Croke Park TASC conference. In any case, he added, breakup is already happening, with massive withdrawals from Irish and Greek banks. “I recommend sterling,” he joked to a concerned audience. A growing section of the Greek left, including the Communist Party, supports this position. Freed from the shackles of the euro, peripheral economies could swap the Irish model for something much more attractive: the path of Iceland. After its own debt crisis, the Nordic island successfully used direct democracy to legitimize nonpayment of debt after the collapse of two highly leveraged Icelandic banks. Once the default was declared, Iceland grew its way out of the crisis thanks to a competitive króna. Several participants at the TASC conference defended the Icelandic example, and Icelandic MP Lilja Mósesdóttir helped launch a campaign for an Irish referendum on the Troika’s austerity package. But going Iceland’s way would mean abandoning the euro, and as the referendum fiasco showed in Greece, that is a terrifying prospect even for left activists who have organized against austerity. After all, working people and small-scale savers would be the worst hit. While members of the oligarchy have already expatriated many billions of euros, much of it to Swiss bank accounts, most Greeks would see their savings evaporate in a return to the drachma. The immediate impact would be a 500–600 percent devaluation. The banking system would collapse and have to be nationalized. Exchange controls would be adopted and the price of essential imports like oil would skyrocket, leading to hyperinflation. Greece would default immediately on all debt denominated in euros. Unemployment would soar, and the economy, at least initially, would go into free-fall. “The pain would just be too great; it would be entirely irrational to take that route,” said Padhraic Garvey, an Irish bond specialist at the Dutch bank ING, in an off-the-record session on eurozone breakup in Brussels. In Athens, a caldron of anger and conspiracy theories, the pain has already gone beyond the limits of rationality. “If we stay in, this euro will be a dictatorship,” Olga Kosmopoulou told me in her surgery, where supplies of cotton wool had just run out and patients waited stoically in the corridors. In or out of the eurozone, they will be the ones who suffer most.